Who owns America’s productive timberland? Timber products are the largest valued agricultural crop in the United States. In 1600, forests covered about 46% of the United States. Today, forests still cover 33% of our nation. In the 1995-96 planting season, tree seedlings were planted on 2,406,700 acres in the United States. The United States is the world’s leading producer and consumer of forest products, accounting for about one-quarter of the world’s production and consumption. The United States is the world’s largest producer of softwood lumber, followed by Canada and Russia. We are also the leading producer of hardwood lumber, softwood plywood, and composite panels. The forest products industry employs approximately 1.6 million people or 1.2 percent of the United States workforce. Forest land has increased 10% since 1920, despite a 143% increase in population. Over 36 million acres of commercially suited forest land is in permanent preserves that will never by harvested. Who owns the South’s forest land? Timber products are the largest valued agriculture crop in the South. In the 1996-97 planting season, tree seedlings were planted on 1,923,721 acres in the South. Since 1952, there has been a 60% increase in the amount of timber (both pine and hardwood) in the South. The most recent forest surveys show annual growth exceeding removals by 13 percent. Softwood growth is 98% of removals (growth is expected to increase due to increase in tree plantings). Hardwood growth is 38% greater than removals. In each of the 13 southern states, the forest products industry ranks in the top 10 among manufacturing industries in employment and payroll income. Approximately 40 percent of the United States timberland is located in the South. The South grows 23 percent of the nation’s softwood and 44 percent of the nation’s hardwood. The southern forest loses approximately one percent of its timber to fire, insects, and disease each year. This 2 billion cubic foot annual mortality equates to nearly one-fourth of the harvest volume. Who owns South Carolina’s timberland? Timber is South Carolina’s largest cash crop, with an annual delivered value of over $876 million. Wood products are the 3rd largest manufacturing industry in the state, employing over 32,000 residents and contributing $8.5 billion annually to our economy. Forested timberlands occupy approximately two-thirds (12.3 million acres) of South Carolina’s land area. In the 2000-01 planting season, tree seedlings were planted on 145,251 acres in South Carolina. Approximately 48 percent of South Carolina’s forests is pine, 52 percent is hardwood. 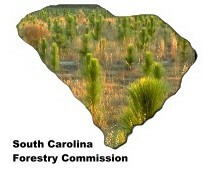 Pine plantations account for nearly 25 percent of SC timberland. Over 300,000 acres were regenerated annually between 1993-2000. There are over 88,000 forest land owners. South Carolina ranks 12th in trees planted in the USA in 1998. South Carolinians planted some 90 million tree seedlings in 2000-01. Forest products are grown and processed in every county. Approximately 78 million seedlings were produced by forest tree nurseries in South Carolina in 2000. To grow a pound of wood, a tree consumes about 1.47 pounds of carbon dioxide and releases approximately 1.07 pounds of oxygen. Young, well-managed forests tend to be the most efficient at absorbing carbon dioxide and producing oxygen. Old, overcrowded, slow-growing forests begin to use more oxygen that they produce. Growing forests are excellent carbon "sinks." Growth in all United States forests removes approximately 9% of total carbon dioxide emissions in the United States. Wood products are efficient to produce when compared to other products. Aluminum products require 126 times more energy to produce. Steel products require 24 times more energy to produce. Glass products require 14 times more energy to produce. Plastic products require 6 times more energy to produce. Cement products require 4.5 times more energy to produce. An acre of trees can remove about 13 tons of dust and gasses from the surrounding environment every year. South Carolina’s Best Management Practices (BMPs) are guidelines designed to protect water quality during forestry activities such as harvesting. On 3 separate annual evaluations, compliance with BMPs has been found to be between 85 and 90 percent. Americans used an average of 749 pounds of paper and 18 cubic feet of lumber and structural panels per person 1994. Lumber manufacturers use about 98% of each tree that is harvested. Processing bark for fuel and mulch, wood chemicals, and all fiber insures almost complete utilization. Lignin is a sticky substance removed from trees in the paper making process. It is used in toothpaste, baby food, some medicines, and flavoring in vanilla ice cream. Sapwood is the part of a tree that stores water. The African baobab tree may have a trunk up to 90 feet around and can store up to 25,000 gallons of water. Bark is the outside covering on a tree that protects from insects, diseases, and fire. The bark of a birch tree may be as thin as one-quarter inch, while a giant sequoia’s bark may be as much as two feet thick. The single oldest living thing on earth is a tree, a 4,600-year-old bristlecone pine tree in California. It was growing when Egyptians built the pyramids. An average singe-family home contains approximately 16,900 board feet of lumber and 10,000 square feet of panel products. The United Nations forecasts that world demand for timber products will nearly double by the year 2050. Forest products are both recyclable and biodegradable. the heating value of 200 gallons of fuel oil.